Blend contains:- Pure Crystal Energy Charged ( Smokey and Clear Quartz, Amethyst) Aqua, Fresh Basil. & Rosemary Infusion. Tea Tree, Eucalyptus Bergamot, Juniper, Frankincense and Lemon Essential Oils. Bach’s Rescue Remedy . Alcohol. Himalayan Salt. * Remove negative energy from the auric field. * Can be used in preparation for meditation or working for spirit or when giving healing to others. * Strongly Anti Viral and great for killing air born viruses. 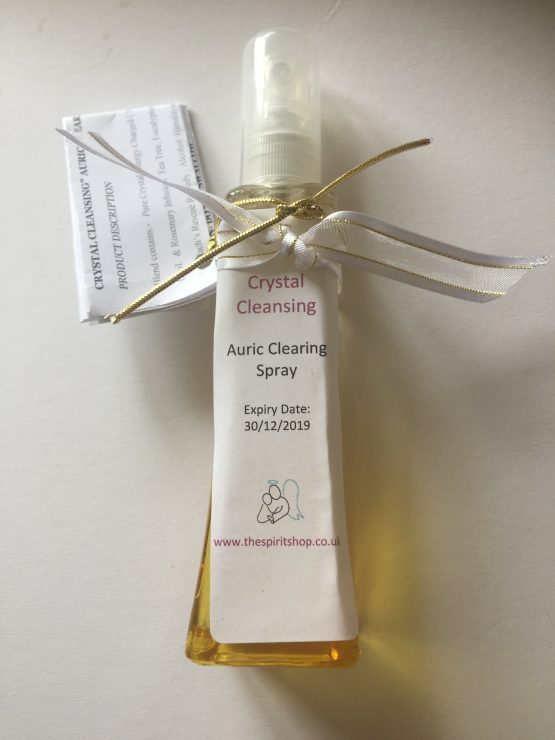 ” Crystal Cleansing” Auric Clearing Spray has a very earthy aroma due to the tea tree and is made more for purpose that aroma. Although this blend is inspired for use on the Aura, it can of course be used as a room cleanser too. 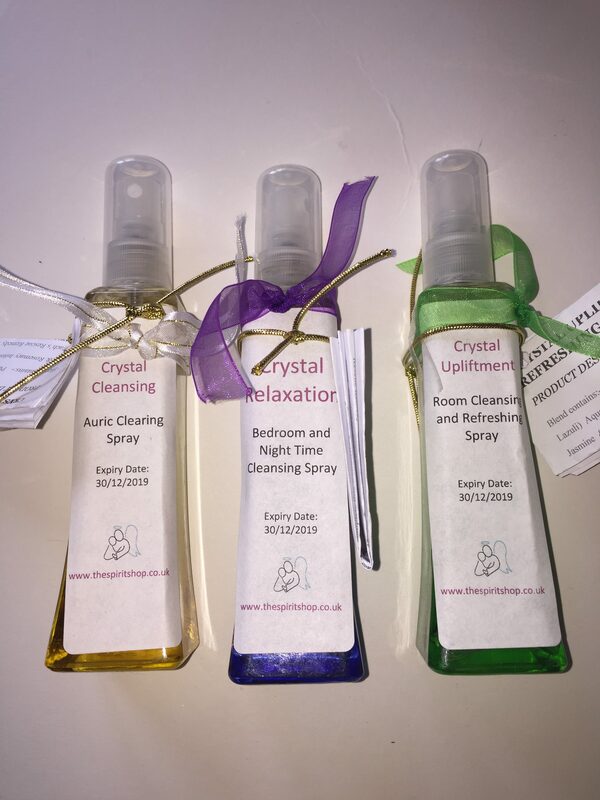 OR If you prefer a more floral perfume in general, we recommend you use the” Crystal Upliftment “Room Cleansing and Refreshing Spray as an alternative. Simply spritz that Auric field area being careful to avoid the face, eyes and furniture including leather and polished surfaced as the contents may cause discoloration or irritation. NOT FOR INGESTION- DO NOT SWALLOW. It is also helpful to visualise any negative energy being released and replaced with pure and positive energy as you spritz. All of our sprays are made in house with the best quality ingredients available with a lot of care and consideration regarding the energies which have been transported into the blend. Pure Crystal energized water is infused with fresh herbs and then laced with Essential Oils and Bachs Rescue Remedy. Intention and healing energy is added to complete this wonderfully healing and refreshing blend. Alcohol has been added to extend shelf life but we recommend you keep it refrigerated when possible. Reiki practitioners and spiritual healers may add their own healing energies to the bottle as desired.